For once, it seems like FCC Chairman Ajit Pai is doing his job. On Monday, Pai released a statement expressing “serious concerns” over a proposed merger of local TV news giants Sinclair and Tribune Media. 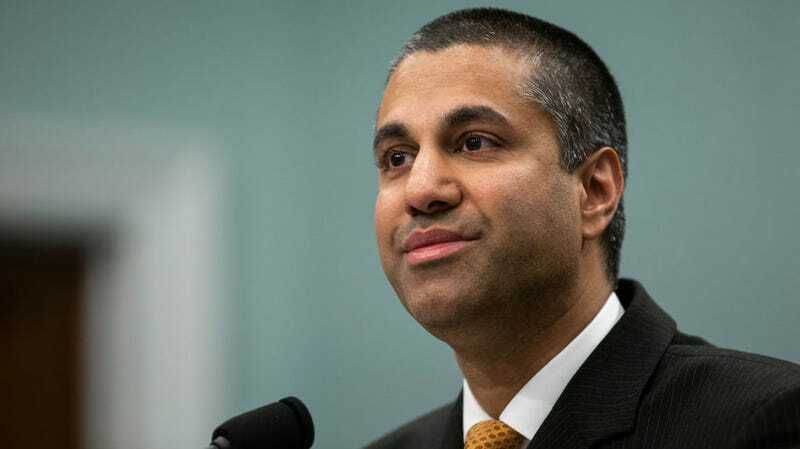 Pushed to the ropes thanks to Pai’s move, the deal was seen as a potential disaster for an already beleaguered news landscape and prompted an investigation by the Federal Communications Commission’s inspector general into potential wrongdoing on Pai’s part. The merger has been under regulatory review since May of 2017, and it’s faced criticism from the left and right over its potential to place too much political influence in the hands of one company. If approved, Sinclair broadcasting’s local TV stations would reach 72 percent of U.S. households, almost doubling the standard federal limit. Last year, Pai implemented a regulatory loophole known as the “UHF discount,” which would’ve theoretically allowed the merger to go forward. Many saw his regulatory maneuver as a transparent favor to Sinclair by an agency head who has valued corporate interests above all others. It comes as a bit of a shock that Pai’s statement today signals that the deal may fail to meet the FCC’s standards. “Based on a thorough review of the record, I have serious concerns about the Sinclair/Tribune transaction,” Pai wrote in his statement. Pai said that he’s circulated a draft order among his colleagues that outlines various disputed factors in the deal, and he acknowledged that the law requires the FCC to hand key parts of the review over to an administrative law judge. As numerous outlets have pointed out, this development in the Sinclair saga could easily be a death blow for the merger. The last high-profile case in which the FCC used the same approach to signal its doubts on a deal was in the 2015 merger of Comcast and Time Warner Cable. And ultimately, the two companies decided to drop their application. The deal received widespread attention in March after Deadspin released a disturbing supercut of Sinclair news anchors reading the same prepared script. The “must run” segments are corporately mandated by Sinclair. At least one anchor, Johnathan Beaton, quit over the propaganda segments, and he was quickly sued by the broadcaster. Other employees spoke out anonymously and explained that contracts with Sinclair make it virtually impossible to leave or refuse to read the prepared scripts on air. “The Media” is often viewed as biased or pushing an agenda by the American public, and there’s no denying that reporters have personal biases—some just show their bias more often than others. But it’s quite rare for a major news organization to mandate a political bias from the top down. Since Pai reinstated the UHF discount that allows broadcasters to side-step restrictions that limit networks reach to no more than 39 percent of U.S. households, it’s been considered a foregone conclusion that the chairman supported Sinclair’s side in the merger. The D.C. Court of Appeals heard arguments in a challenge to the rule change back in April, and although it hasn’t released a decision yet, the hearings reportedly “went poorly for the FCC,” according to Bloomberg analyst Matthew Schettenhelm. Throw in the inspector general’s investigation into potentially improper coordination between Pai and Sinclair, and the chairman’s decision to slowly back away with a shrug makes a good bit of sense. But don’t worry, everyone. Pai’s days of shilling for telecoms are surely not over.